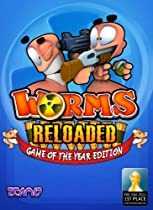 Team17’s award-winning turn-based strategy title Worms Reloaded returns in a new ‘Game of the Year Edition’. With a popularity that spans generations, and a 2D gameplay style that is both classic and fresh in equal measures, Worms Reloaded sports over 60 single-player missions, full team and game style customization, compelling multi-player action, landscape editing tools including the ability to import images, HD visuals and many of the best weapons from Worms series past and present. Included is the feature-packed standard version of the game and all of the great add-on DLC content! See why Worms Reloaded was the proud winner of the “Best European Strategy Game” at The European Games Award 2011!Key Features: Extensive single player content featuring 65 missions in Campaign mode, Bodycount mode and Training mode Online and Local Multiplayer with up to 4 player action, friends lists, leaderboards, achievements and chat Massively increased customisation allowing to change the appearance of worm skin, victory dances, gravestones, voices, HUD, more than 70 hats and over 70 speechbanks New fully featured landscape creation tool allowing changes of all apsects of the game to fit your own style Worms weaponry and utilities including 47 weapons Requires Steam Client to activate.